Rated: R for strong violence, gore, and language. First off, if you’re not a fan of the Underworld series, don’t expect this one to turn you into a believer. As a matter of fact, you probably already have no interest in seeing this one, and, on that note, shouldn’t. Kate Beckinsale is back in black! 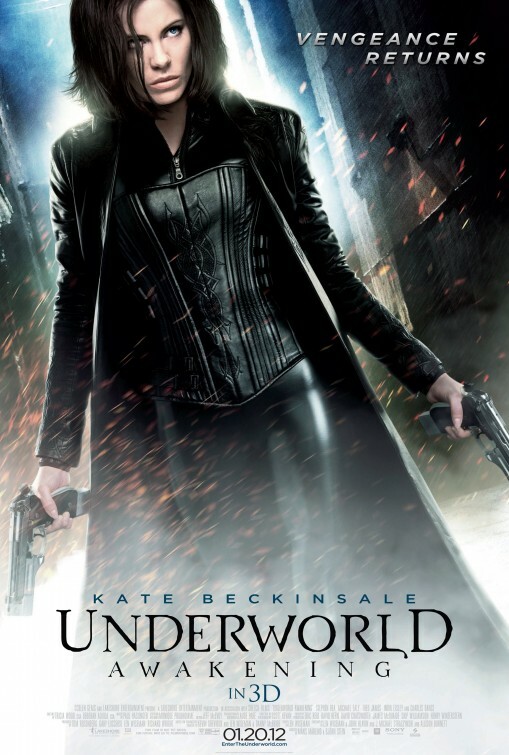 The Underworld franchise returns to the big screen with this latest continuation of the series. Years have passed since we last saw Selene, the death dealer, fighting against Lycans, and much has happened in that time. The film begins with a quick comprehensive flashback of a recap and then quickly immerses you right into the action! 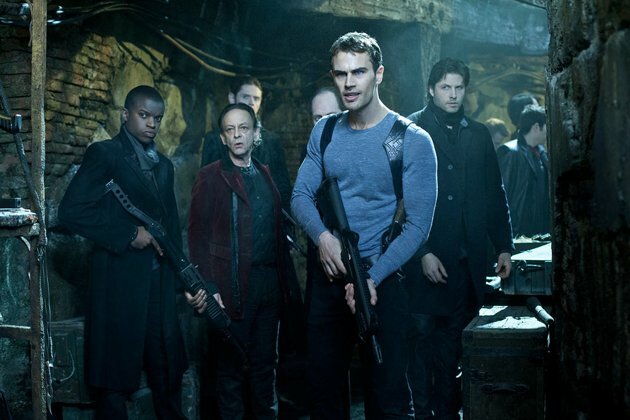 With high expectations from a faithful following of the series, Underworld Awakening delivers. My bias aside, Underworld Awakening does succeed in a few areas, but, however, it unfortunately disappoints in more. Produced by Len Wiseman (who directed the first two), but directed by Måns Mårlind and Björn Stein (who mainly directed television series). The directing team did decent for their first stab at a full-length major motion picture, but their previous experience seemingly limits the movie from taking off and being a standalone film. Action-packed with great slo-mo effects and the expected violence/gore, yet several stoic performances yield very little development of any of the characters in the film. Ignoring one of the biggest strengths of the previous installments: great backstories of the characters providing depth, emotion, and relativity. Similar look and feel as the previous films, but this first venture of the series in 3D = epic fail. Pointless to watch in 3D. Pointless. Great cast with new introductions that seemingly fit into their roles nicely. However, most ended up being underused. The film needed to be longer to provide better development and usage of the cast. (Theo James, Kris Holden-Ried, Michael Ealy, Charles Dance, all deserved better development of their characters). And yes, Kate Beckinsale -while hot!- still remains mostly expressionless throughout the film. Probably the biggest criticism I have read about her role in Underworld Awakening. It should not, however, be viewed as a flaw of the film due to the fact that it truly contributes to her character’s plight and helps tell the story a little bit better than the directing team could. A great reintroduction to Underworld, but with so many subplots and teases leading to future installments (of this I have no doubt), Underworld Awakening starts off in a direction down multiple paths that end with very little resolution. Fans will recognize certain characters and expect to see more of them…only to be left with disappointment. Now, when it comes to the action sequences and the fights between Lycans and Vampires, Underworld Awakening excels far beyond the little squabbles seen in teeny-bopper films of sparkly vampires and shirtless boy-wolf packs! The dark tones, excitement, action, creatures, a few twists and teases make this film to be fun for any and all fans of the franchise. But, other than that, it’s a rental at best. (Don’t be mad!) ha! I saw the first two Underworld films (and thought they were just ok- fun for a rental or a catch-it-on-cable type of thing), and I’m glad to know the series has stayed true to its roots of gory monster fun. adam, welcome to my page and thank you for taking the time to read and comment! I’ll be interested in your thoughts once you watch this one! haha! a great comment here! Glad I could save you from further need of pepto bismal. haha. See I am somewhat interested in the series, so I may see this eventually if I watch the others. But at the moment this marathon has me swamped! Good review my man, I’m glad you at least enjoyed yourself! I like Underworld. One of the best things about it is that the actors who play any particular character continue to play it whenever they appear in the films! I love it when a series can accomplish that! I never found the Underworld movies to be anything special. And i’ve started watching twilight just to see what the hoopla is all about…and for me the main characters are the major issue(That, and a terribly written plot, which only gets good in the last 20 minutes or so of the second). 2 movies in and Jacob happens to be the only decent character, who then gets ruined to make way for Edward. For comparison sake, i love the Vampire Academy books, which don’t follow the traditional vampire mythology. However, the characters are interesting and the plot is well written, so i don’t mind it having a slightly different mythology to it. Underworld is nothing too special. It is what it is. But I enjoy the series exactly for that. sorry your trudging through Twilight. Really enjoyed this movie, its definately best experienced in IMAX, there’s some really good sequences. I really enjoyed the entire series because it was focused on a very deep plot with a pretty good love story. This movie didn’t do that. They did however leave a LOT to continue on, maybe this was the action film that awakens the series so they can resume the deep story. Nathan, welcome, and thanks for reading and commenting. I remain hopeful, like you, that the resumption of the deeper story that strengthened the original films does follow.